Want some atmosphere lighting around the exterior of your house? 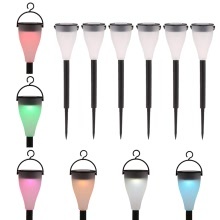 These 7-color solar powered lights are definitely the best choice for you. Each one comes with a stake and a hanger. Everything you need to get set up is provided in this package. There is a switch on the underside of each solar panel for you to choose between "smart white" (a different color daily , 7 colors in total), "cycling"(the 7 colors flash circularly) and "lock"(set one color for long lighting). They are very bright and look amazing. VERSATILE: 3 modes: "smart white" (a different color daily , 7 colors in total), "cycling"(the 7 colors flash in loop) and "lock"(Select your favorite color for long lighting). Great decorative lights to make the ambiance more romantic and intimate. EASY TO ASSEMBLE & MULTIPLE APPLICATIONS: Assemble these lights just in minutes, then you can hang them on tree or stick them into ground with the provided accessories. Widely place them as decorative lights on your landscape path, lawn, veranda, park, square, courtyard. ENERGY-SAVING & AUTO RECHARGING: Built-in Solar Panel absorbs sunlight to recharge itself during day and the light will automatically light up in the night, which save your electricity bill and save your labor. WATER-RESISTANT IP65: Securely use this light in rainy and snowy days. 5000 hours long service time. LONG WORKING HOURS: 6 hours charging time under strong sunlight can support 8-10 hours working time. Make sure these lights are fully charged before first time using. Please put these lights in sunny area when charging. Put the switches to "on" will increase the charging efficiency. Pay attention to safety during installation, and periodically check to ensure secure and reliable.